Don’t think I haven’t heard that before. I don’t know how to depend on anyone. I start to cry. I tell him that I want to believe in this, and it is so hard for me to believe in this. I need him to believe even more than I do in this right now. Because depending on anyone to really show up, and be present for me and these boys is not the cloth I am cut from. I started a family on my own for a reason. It is all I have really known for almost nine years. I’ve gotten so good at doing this alone. What if I’m not as good at doing this with someone else? Do you see this as a good thing? Do you see that being in a committed loving relationship will make it easier? The pause is pregnant. I want to. I know that I want to. I am almost there an awful lot of the time. I’m not there a lot of the time too. It must be hard to believe in me at those moments. But he does. Because I need him to. Because he needs to too. When I can’t seem to get myself from the middle where my panic in this transition lives, to the new place where he seems to be dancing alone on our new island humming; “I’m having the time of my life,” I think of that vase. Alone a vase has a great deal of potential for beauty. Cut flowers on a counter, are not going to survive very long that way. But when you put them together? Something new and stunning happens. Of course, wild flowers outdoors look magnificent there too. Yes, they do, and they run the course of their lives intentionally that way. In a vase, or outside. and at the same time I also fear that which is so terribly unknown. 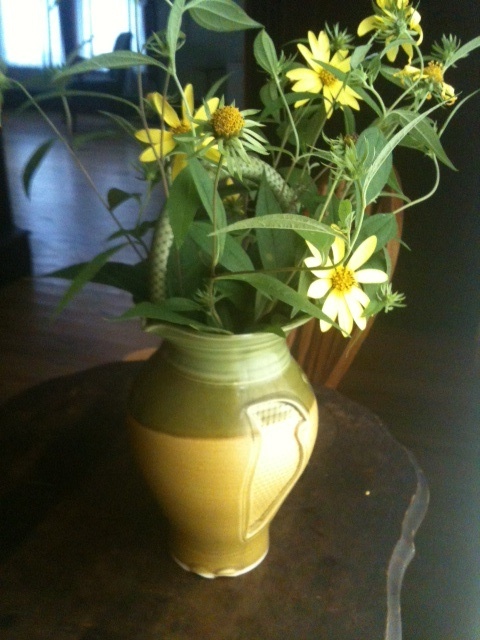 I love all that we can be, these flowers and this vase. I love how open you are, and how you hold me in all my glory for every fleeting moment that is now, always. I love your strength, and your fragility. I love your stance. I love your dance. I love your patience and your desire. I love this vase, and how much more purposeful you become with me inside you. I just started following your blog. This story was beautifully written and timely. I started reading this minutes after placing some yellow flowers from the garden in a vase that I just unpacked. I just moved into a house and I feel so unstable and excited and many of the feelings you shared above. I’ll be thinking of you and your beautiful family as you take this brave next step. I love your connection with the flowers. It gave me great pleasure to read that comment. Thank you for your kind words, and I wish the same ease your way! What wonderful news! Such positive changes. Thanks Mama! It is gosh darn BIG indeed. We’re taking it one day at a time. Congratulations! I love the symbolism. Nicely done. Keep breathing and believing. You will be fine! I think you might be right. If this is the Cheryl I think it is, take some credit for me getting this far! big step! what a wonderful thing for you all. It is so big. And yes, it is wonderful for ALL of us. Truly. Always love hearing from you. Quite scary and wonderful. Beautifully put. This is beautiful. Just lovely.